" You're here for a reason.You just don't see the connections yet.But not just because you don't see them doesn't mean they are not there"
Amanda Seyfried as Mary Katherine (a.k.a. M.K. ), Professor Bomba's 17-year old daughter. She is named after William Joyce's deceased daughter. Following the death of her mother, Mary Katherine (a.k.a. M.K.) (Amanda Seyfried), a 17 year old teenager, moves in with her estranged and eccentric scientist father, Professor Bomba (Jason Sudeikis), who has been searching for tiny human soldiers, about which M.K. is skeptical. She wants her father to stop his work. Unknown to the both of them, Bomba is right that there are tiny soldiers called Leafmen. They protect the forest Bomba lives near from evil creatures called Boggans (who shoot arrows that can kill any living thing) and their malevolent leader Mandrake (Christoph Waltz) who plans to destroy the forest. An independent young soldier, Nod (Josh Hutcherson) decides to quit, much to the ire of the no-nonsense Leafmen leader Ronin (Colin Farrell) who wants Nod to learn about teamwork. The queen of the forest, Queen Tara (Beyoncé Knowles), who is aware of Ronin's apparent attraction to her, decides to choose an heir to her throne and goes out to a field of leaf pods, guarded by a laid-back slug named Mub (Aziz Ansari) and an uptight snail named Grub (Chris O'Dowd). Tara chooses the smallest pod as the heir. Immediately after she does so, the Boggans attack. Tara flees the area with the pod, and though her bodyguards do their best to protect her, they are soon overwhelmed by the sheer number of Boggans. Tara uses her magic to slow down her pursuers, and is at one point rescued by a flower child who idolizes her. Eventually, Ronin arrives for her and the pair fly off on Ronin's hummingbird mount. They are then attacked by Mandrake and his son Dagda (Blake Anderson). Dagda is killed by Ronin, but Tara is shot by Mandrake, and falls off Ronin's bird into the forest. Meanwhile, M.K., annoyed at her father, decides to leave and leaves a note on one of his security monitors. Before she can leave, the family's one-eyed, three-legged dog, Ozzie, runs into the woods. While looking for Ozzie, M.K. sees Tara falling. A dying Tara gives her the pod and uses her magic to shrink her. She tells M.K. to take the pod to a Glowworm named Nim Galuu (Steven Tyler) before she dies. After meeting Ronin and the Leafmen, along with Mub and Grub, a confused and scared M.K. joins them. Ronin discovers that Nod has entered a race against other creatures and bugs on birds. He goes back on a deal with a tough bullfrog named Bufo (Pitbull). Before Bufo and his gypsy moth and scorpionfly goons can kill Nod, Ronin intervenes and orders the goons to leave. A reluctant Nod joins him, M.K., Mub, and Grub after hearing about Tara's death and falling for M.K. They eventually find Nim Galuu, who is a showman and keeper of magic scrolls that tell what has occurred during the history of the forest, in a tree. After learning about Tara's death, he leads the group down to the scrolls, where M.K. discovers Tara's brief message before shrinking her, and a message that will get her back to normal size. When Ronin leaves, Nod takes M.K. on a enthralling deer ride, where they begin to fall in love with one another. Mandrake (to whom Bufo fearfully reveals the location of the pod, which he overheard from Ronin and Nod) arrives and kidnaps Mub and Grub and imprisons them, along with the pod, which he hopes to bloom in darkness to destroy the forest. To get into Boggan territory undiscovered, M.K., Nod, and Ronin set out to Bomba's house to get some disguises, where M.K. learns that her father is what the Leafmen call a "stomper" and have been leading Bomba off their trail. After getting the disguises, Ozzie (who earlier returns to Bomba's house) sees M.K. and chases her, catching Bomba's attention. He sees the group and catches M.K., but faints after seeing her. Before leaving, M.K. marks where the Leafmen territory is on one of Bomba's maps with a red push-pin. When they reach the Boggan land, which is a wasteland of dead trees, Ronin distracts the Boggans while M.K. and Nod rescue Mub, Grub, and the pod. They are eventually found out by Mandrake, who summons the Boggans to stop them. M.K., Nod, Mub, and Grub escape alive, but Ronin sacrifices himself to ensure their escape. Before the full moon can sprout the pod at Moonhaven with moonlight, Mandrake's bats block the light, causing the pod to begin sprouting in darkness. When the Leafmen set out to fight the Boggans (with Grub unsuccessfully joining them) M.K. sets out to get her father for assistance, but an exasperated Bomba, after regaining consciousness, decides to give up on what he has been doing to find his daughter and shuts off all his cameras, believing that he didn't really see M.K. and that he's been insane all his years, but changes his mind when he sees the push-pin in his map. After locating M.K., Bomba is overjoyed to see that he has been right and when he follows M.K. to Moonhaven, he (with his daughter's persuasion) uses his iPod to make bat sounds, causing the bats to follow Bomba. Meanwhile, Mub and Nim Galuu try to stop Mandrake from reaching the pod, but are unsuccessful. Just then, Ronin appears, bearing scars and bruises from Boggans. Mandrake manages to outdo him, but Ronin is defended by Nod, who earlier finally understands the importance of teamwork. Before Mandrake can obtain his victory, the moonlight takes over the pod before it blooms in darkness, causing it to bloom in light and Mandrake gets sucked into a tree. It also heals the forest after much damage from the Boggans. The chosen heir is the flower child who idolized and saved Tara earlier in the film. Grub becomes a Leafman, Nod and Ronin reconcile, and Nod and M.K. hug and kiss and become a couple before M.K. is given back her original height by the new queen. After reuniting with Bomba and becoming his assistant, the reunited human family still keep regular contact with their new small friends (M.K. with her boyfriend Nod) as they continue the research of the world in their home. "Though the story may be slight, the film is stacked with brilliantly colorful characters, a fabulous voice cast and simply spectacular animation" "A fantasy forest is a fabulous setting for animation; it is filled with all shapes and sizes and colors of flowers and animals ... Sweet and funny and sometimes exciting, Epic is a cleverly made visual delight, certain to keep younger kids entertained "
When it comes to action kiddie movies,I'm used to watching MALE warriors as the main character so I was a bit surprised when I saw that the main character for this movie is a FEMALE.What I can remember from this story is the very colorful world of the fairy tale kingdom.I enjoyed the flowers and trees and animals being alive.The movie is visually entertaining and attractive and colorful and I love how they put the whole creatures in character.I'm a lover of nature specially wild flowers and orchids.And I love fairy good mothers and kind hearted fairies. When I think of this movie,all I can think of is Queen Tara's kindness.I think of Ronin's chivalrous heart.I think of the two funny and enthusiastic snails that makes me smile every time and I remember the cute wise caterpillar entertainer.I think of the beautiful flowers and trees being protected.I think of home.I think of my childhood days in the forest.I think of home and funny how it makes me feel beautifully sad.I'm sad because I'm not there anymore but I'm happy I grew up in the arms of nature and I will always carry that memory with me.It's the only thing that draws me home. Eep:Aaggg,weve been livin in this cave forever! Grug: 3 days is not forever! Nicolas Cage as Grug Crood, a caveman who is the well-meaning, overprotective but old-fashioned patriarch of the Croods family. Emma Stone as Eep Crood, a rebellious teenage cavegirl who is Grug and Ugga's eldest daughter and is filled with curiosity and a desire for adventure. Ryan Reynolds as Guy, a nomadic caveboy who is not as strong as the Croods, but prefers using his brain and comes up with various ideas and inventions. He is accompanied by a sloth named Belt and is Eep's love interest. Catherine Keener as Ugga Crood, a cavewoman who is Grug's wife. She is more open-minded than Grug, but also finds it difficult to keep her family safe. Clark Duke as Thunk Crood, a caveboy who is Grug and Ugga's son. Thunk is the 9-year-old middle child, who is not very bright and has bad coordination but has a good heart. He gets a crocopup named Douglas for a pet. Cloris Leachman as Gran, a very old and ferocious cavewoman who is the mother-in-law of Grug and the mother of Ugga. Chris Sanders as Belt, Guy's pet sloth. Eep (Emma Stone) is a girl in a family of cavemen living and hunting in pre-historic times, talking about how her family is one of the few to survive, mainly due to the strict rules of her overprotective father, Grug (Nicolas Cage). In their cave home, Grug tells a story to the family, which includes his wife Ugga (Catherine Keener), his daughter Sandy (Randy Thom), his son Thunk (Clark Duke), and his mother-in-law Gran (Cloris Leachman) with a character who mirrors Eep's curious nature. He uses this story to warn the family that exploration and 'new things' pose a threat to their survival, and says to never not be afraid. This irritates the bored and adventurous Eep, and when the family falls asleep after dark, she ignores her father's advice and leaves the cave when she sees a light moving outside. Seeking the light's source, she meets Guy (Ryan Reynolds), a clever and inventive caveboy. She at first attacks him but then becomes fascinated with the fire he creates and is eager to learn more. He tells her about his theory that the world is reaching its 'end' and asks her to join him. She refuses and Guy leaves, but not before giving her a noise-making shell to call him if she needs help. Eep is then caught by Grug (who had been searching for her), and is later grounded for what she had done. Grug brings Eep home and is joined by the rest of the family, who Eep tells about Guy and shows the shell given to her, only for them to destroy it in fear of 'new things'. An earthquake then occurs, sending everyone running for the cave, only to be stopped by Grug moments before the cave is destroyed by falling rocks. They climb over the wreckage to discover a land with lush vegetation, much different from their usual surroundings of rocky terrain. Grug takes his family into the forest to find a new cave. After an unsuccessful hunting attempt, Guy, his 'pet' sloth, Belt (Chris Sanders), and Eep build a puppet to fool and lure nearby animals. After they make a capture, the family greedily devours everything they caught. Grug then tells another of his morale-lowering tales, this time mirroring the events of their day. Guy then tells a story of his own about a paradise he nicknames "Tomorrow". The next day, the family reaches a path coated in spiked rocks which Grug, Thunk, and Gran get pricked upon trying to cross them. A freed Guy presents one of his inventions called shoes. He makes some out of all the resources he can find for each family member. This gains him some respect from the others except for Grug, who feels jealous of Guy's cleverness. After Guy's ideas help the Croods on their journey, the family members gain something. Ugga, Gran, and Sandy have their first idea to get past carnivorous plants by hiding under flower heads as they pass, Thunk encounters and befriends a crocodile-like dog he calls Douglas, and Eep and Guy grow closer while Grug is stranded in a ravine forcing Ugga to go back for him. The next day, Grug shows the others some of his ideas (like a see-saw, shades made out of wood, a snapshot that involves the family being slammed with a flat rock) which fail and humiliate him. They soon reach the mountain where Grug is unable to convince the family that settling in a nearby cave is a better option. Angry, he attacks Guy. The two become stuck in tar and Guy reveals his family died drowning in it and their last words inspired his traditions of "Tomorrow." Grug has a change of heart towards Guy and he and Guy trick Chunky into freeing them by pretending to be a female "Macawnivore" in trouble. As they are about to reach their destination, an earthquake opens a deep ravine in their path. Grug throws each of them across the gap and reconciles with Eep while creating the first hug with her. Grug then throws her across the ravine and is left behind. He takes shelter in a cave and makes a torch. After seeing a blank rock face, he paints a large cave-drawing of the Croods and Guy together. He then encounters Chunky, who attacks him until Grug's torch is accidentally blown out, panicking them both. The newly reformed Chunky lies near Grug, who has his first good idea. He uses a skeleton carried by the Piranhakeets to transport himself, Chunky, Douglas, and several other animals across the ravine, barely escaping the oncoming "end" destruction. He and the rest of the family settle down in a paradise-like environment. Grug becomes less protective, letting the family be more adventurous and risk-taking, thus bringing happiness to them all. Croods is a very entertaining movie and is perfect for family bonding time if you're looking for one.The story is very simple but hilarious.I like their creativity and I think it's wise to portray a prehistoric lifestyle so children today will learn to appreciate how blessed their lives are today.It's funny and very entertaining but I really wish those who watched this movie should be grateful with what they have right now in terms of providing their basic needs. On the other hand,it also goes with grown ups.Lots of parents are usually stuck with work stuff that they don't have time for their family anymore.While I was watching it,I realized how simple and less complicated life is back then.They really have a real physical and visual family bonding time.One of my favorite scene was the part when Crug was telling a story by memory.No books,no Tv,no computer,no visual aids.He just have to verbally tell the story pouring all different emotions just to give life to his story.The best part is a child can easily imagine and recreate the story in his own imagination when you let them.That's the beauty of traditional story telling. In a Jungle in Africa,King Mufasa and Queen Sarabi gathered all the animals in his kingdom to celebrate the birth of the future king Simba.His younger brother Scar didn't attend the celebration due to jelousy of not becoming a king.Scar planned on killing both his brother and Simba so he can tak the throne.First he had got Simba's curiosity to visit a very dangerous place where all the hyenas live but Mufusa managed to save him.An angry Scar took an alternative plan by causing a stampede.Mufasa saved Simba but was shoved away by Scar when he was struggling to save himself.He was killed by stampede.After the stampede,Scar tricks simba into the thought that he killed his own father and advised him to run away and never come back.A scared Simba ran away from Pride Lands. Simba now far from home collapsed into a desert where he was found by Timon and Pumbaa and took care of him where he lived by the moto of "HAKUNA MATATA" meaning living in a care free life.Timon and Pumbaa was attacked by a lioness so he went to rescue them only to find out,it was Nala her childhood friend.The two reconciles and feel in love.Nala tries desperately to get Simba back home by telling him that Scar took over as the king of Pride Lands and that the hyenas took over as well.She told him that the kingdom was a mess and is in total hunger.Simba still feel guilty about his fathers death refuse to return. Wise mandrill Rafiki tracks Simba down, telling him that Mufasa is still "alive" and taking him to a pond where he is visited by the specter of Mufasa, who tells him that he has forgotten who he is and thus must take his rightful place as the true king of Pride Rock. Simba then realizes that he can no longer run from his past and goes back home. Nala, Timon and Pumbaa follow him, and agree to help him fight. At the Pride Lands, Simba confronts Scar on Pride Rock after he attacks his mother Sarabi. Scar taunts Simba, who still feels guilt over his father's death, but after pushing him over the edge of Pride Rock, Scar reveals that he killed Mufasa. The enraged Simba jumps back up and forces Scar to reveal the truth to the other lions. Timon, Pumbaa, Rafiki and the lionesses fight off the hyenas while Scar, attempting to escape, is cornered by Simba at the top of Pride Rock. Scar begs Simba for mercy, saying he is family and places the blame on the hyenas. Simba says he does not believe Scar anymore, but spares his life and tells him to run away and never return. Scar meekly walks past him, but then attacks his nephew. After a fierce battle, Simba triumphs and throws Scar off Pride Rock. Scar survives the fall, but is attacked and killed by the hyenas, who overheard his attempt to betray them. With Scar and the hyenas gone, Simba descends from the top of Pride Rock where he is acknowledged by the pride as the rain falls again. Sometime later, Pride Rock is restored to its former glory and Simba looks down happily at his kingdom with Nala, Timon, and Pumbaa by his side; Rafiki presents Simba and Nala's newborn cub to the inhabitants of the Pride Lands and the circle of life continues. This is one of the most popular kiddie movie when I was younger but I just had the chance just to watch it now.I now understand where the excitement is all coming from.It was evident the movie was fantabulous! I love the effects,the cinematography and most of all the story itself.It was never boring.It was very entertaining from the beggining til the end! If only I can turn back time and be a little girl again,I'll probably watch Lion King over and over again.I think the kindness and awesomeness of King Mufasa and the cuteness and inquisitiveness of little Simba will surely amaze me.A lion is carnivorous by nature.It has to hunt animals too as their food but thanks to this fantasy movie.I'd probably think too as a kid that Lion's are harmless and cute and only eat vegetables! 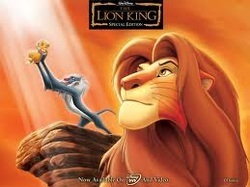 King Mufasa served as the protector to the animal kingdom.He was well respected by all the animals.He was powerful.He was a loving husband and an affectionate father to young Simba.No wonder it was loved by millions of people around the world and recorded as one of the highest grossing film of all time! (as per WIKIPEDIA) promotes family values.I mean these days,I think we need such reminders even if it's through a fantasy film.Really good! One of my favorite scene is when Simba and his father was sitting on the mountain top watching the beautiful sunrise.His father told him everything that the sun covers is their kingdom! It was one of the sweetest moment because I rarely see kids bond with their parents these days because of the fast faced life we have.Some families still bond of course on a SUnday usually in a mall having lunch on a specific unhealthy fastfood .I rarely see parents who spent time playing or hiking or just talking with their kids on regular days.Or maybe,It was just me who never saw parents who still do this with their kids.Either way,I wish I still belong in a generation who still have this family value.Or maybe I'm just being emotional as I never experienced such kind of family bonding.I actually don;t know anymore who is speaking.Is it my childhood fantasy or is it something that I wanted to do when I have my own family. I also love the character of Nala,Simba's childhood friend.They were separated in years and she doesn't have any idea if Simba is still alive but when they meet again,it was like the old days again.Nala recognized Simba immediately considering the physical changes.I kinda root for such type of friendship.Maybe I value loyalty and love in my relationships.It's the first thing that I noticed.I think it is one of the most wonderful treasures one can have in life.I think genuine friendship is everything.I still don't know why I wish I have a childhood friend and we grew up together.A person who knew me very well since my childhood days.But maybe,i should be careful what I wish for.Somehow,it's kinda scary too because one must have loaded tons of trust and connection to that person.One's that person is gone or betrayed me,I guess it would be too hard for me to handle.Either way,I'm thankful for the people I have in my life now. The most entertaining part for me is when Simba met Timon and Pumba.There name said it all meaning they are fun friends and fun to be with!That part when they sang "Hakunah Matata" which is also my favorate song of all made me want to dance and sing with them.It gives me the feeling of wanting to wander through the woods and leave all my worries away.It was just very hilarious and entertaining at the same time.Take note,Simba met them at the must crucial part of his life.He ran wanting to leave his past and he was rescued by such easy go lucky friends.COme to think of it,Same goes with real life.We have our pains,our responsibilities and we have our deep dark secrets that wanted to leave behind us.On my case,with the help of light hearted friends,they kinda lift me up and make it look like it was nothing. No man is an island.Live,laugh love.Hakunah Matata! Indeed,we grieve of the pain but we should not dwell on it.Enjoy life instead,after all life is too short to waste on just one problem.This movie displayed moral example specially on the importance of family and friends and same time left us with a challenge to not run away from our responsibilities but rather face them courageously.There were always people in our lives who teaches us something.We just need to know where and when to listen.The most powerful and emotional part of the movie for me was when Simba followed Riki and he saw his reflection on the water as he heard his father's voice.At first,Simba is not willing to return to pridelands.He wanted to just have a happy and less stressful life but when he saw his reflection,he knew he was a son of his father and that he was called for a greater purpose.He returned to pridelands and fullfill his duty-to serve and protect his Kingdom. And it goes with life.Personally I should have been an epitome of failure if God never blessed or guide me.I was a wanderer,so lost and trying to escape from my painful past.I knew nothing.I have failed a thousand times while trying to survive.There were times I really wanted to just give up.But with the help of God,he was the voice behind me.He blessed me with people who kept me on track.I met my NAla and Pumba and Riki.I even met more than what I asked for.From time to time,I see my reflection in the eye of a stranger.Or when torn between important decisions.I see my reflection in the reaction of my friends and people behind me.I may not be the best person in my family biut I know they are my pridelands.As of know,I'm still on the process.I'm still trying to discover where I'm supposed to be. Thanks to this film,to a kid it was just a cute lion.To someone else it was very entertaining.But for me,it is a window to my soul.A moment of reflection.I just hope I didn't go over emotional but rather be positive in life.Indeed,all things happen for a reason.In between those gaps,God never failed to feel in so I can go to the other side. "Not perfect, but its aspirations are admirable, and its execution is surprisingly effective considering (or maybe because of) its unadulterated sentimentalitY "
I totally agrree that the narration in the movie is annoying but in the course of time,you tend to forget about it because you will be more focus on the sweetness and beauty of the story.I appreciate the movie makers for not exploiting such young talents but instead they have presented a decent story that I can even recommend for the youngsters to watch. I was also impressed of the main casts because they were indeed impressive and talented.I was like wondering how did they portray their roles so beautifully and perfectly! I really admire kids who can act beautifully as if they own the story. I also appreciate the director of the movie.He didn't over do it nor abuse the young talented kids.He brought out the best in them.No matter how the movie turned out,this movie is defintely one of my favorite on the list. The story is funny and at the same time heart breaking.It reminds me of the reality when we were kids,atleast we had admired someone .I might not be our neighbor like Julie but we had our very own experience of admiring someone so much that might have cause us either pain or joy.Sometimes it's both. When I was a kid, I didn't have much opportunity to be open about my crushes since I lived in the conservative environment .I came from a family who doesn't chat over dinners or lunch to discuss personal issues.We are unexpressive interms of personal matters specially when it comes to our love life or even crushes . It's very embarassing to be teased to death by my brothers. When I was in high school,i had a few crushes and I totally knew what it felt to be ignored by your very crush.I know what it feels to exert all effort to please him but in the end,he's just one snub.The difference between me and Julie is atleast her guy loves her secretly but as for me,my crush never knew my feelings for him.In a way, I'm glad because I felt like he might be disgusted if he found out or worst he might have hated me for real! It just felt good to be reminded of those days because it made me smile somehow.It reminded me of the feelings and the stupid things I did just for the person I admire.It made me laugh.I was like smiling all through out the movie because I have a lot of flashbacks and it's just crazy and funny and stupid because we use to sing the old song "and they call it puppy love" a song my step dad use to sing always when he is drunk . This movie reminded me of some experience in my life that weren't easy but had pushed me to my limmits and the result is real good.i'm more than thankful and greatful for having such experiences. It's a perfect reminder to all of us. If you are a kid,don't be in a hurry to grow up because you can never turn back time once you get older.No matter how many times you wish you were a child again,it can never happen.You don't have the luxury to write cards or to cut heartshape cards anymore or to stick a gum on your desk.You don't find friends who teases you with your crush genuinely.Because when you're grown up and someone teases you,you can't tell if that's genuine or not.It's either they do it to shame you or they over do it to check on you.You'll really miss the childhood innocence. So the lessson here is to enjoy life presently.Don't be bothered by past mistakes or be worried with future possiblities.We don't have any control to those anyway so live and face life happily as long as you may! In 1957, when second-graders Bryce Loski (Callan McAuliffe) and Julianna (mostly known as Juli) Baker (Madeline Carroll) first meet, Juli knows it's love. But Bryce isn't so sure. Girl-phobic and easily embarrassed, young Bryce does everything he can to keep his outspoken want-to-be girlfriend at arm's length for the next six years, which isn't easy since they go to the same school and live across the street from each other. When they start the sixth grade, Bryce hopes that he can get rid of Juli so he asks the girl Juli hates the most, Sherry Stalls (Ashley Taylor), out on a date. This plan of Bryce's works for a while up until his best friend, Garrett (Israel Broussard), takes an interest in Sherry and tells her the truth about Bryce asking her out. Juli finds out Bryce and Sherry break up; she goes back to her regular Bryce-obsessed self. From Juli's point of view, when she and Bryce first met, he returned her feelings but was just shy and embarrassed. When he "held her hand" she thought she would get her first kiss from him in the second grade. Juli knew that she was flipped from then on. After finding out that Bryce and Sherry broke up, she thought she could have her old Bryce back. She spent the whole year smelling his watermelon scented hair and wondering if she'd ever get her kiss. In 1963, now in seventh grade, Bryce's grandfather Chet Duncan (John Mahoney) moves in with the family. Chet finds Juli different, special, and a rare kind of girl who's hard to come across. He continues to tell Bryce this with hope. There's a large, old sycamore tree that Juli loves which no one understands. One day, it's cut down by the owner in spite of Juli's protest and dismay. Her voice narrates her love for the tree that let her see the world in a much more enlightened way. Chet and Juli form a strong friendship over time while he helps her work on her messy lawn. Bryce begins to develop feelings for Juli just as Juli begins to question her feelings about Bryce. Her feelings completely disappear when she overhears him and Garrett talking about her mentally challenged uncle, and sees him throwing away the eggs she gave him. Juli tells Bryce she never wants to speak to him again when she and her family get invited to the Loski's house for a sit down dinner. She continues to have mixed feelings when the basket boy auction is just around the corner. She hears that Sherry is planning to bid on Bryce against another one of the school's "finest" girls. Bryce thinks that Juli is planning on bidding for him because he hears she walked in with a wad of cash (which she wasn't planning on having with her). Bryce begins to worry about what would happen if she does bid for him just when she bids all her cash on basket boy number eight, the boy before Bryce. Later during the basket boy bidding lunch, Bryce and Sherry sit at a table across from Juli and basket boy eight, Eddie. She's facing Bryce and he can't help but stare at Juli the whole time. He sees she's having a good time with her date and gets jealous. He grabs her to talk to her and attempts to kiss her in front of everyone. Ignoring all the shocked crowd, tells Garrett he was wrong and how he loved her. He chases her out after Juli dodges his kiss.